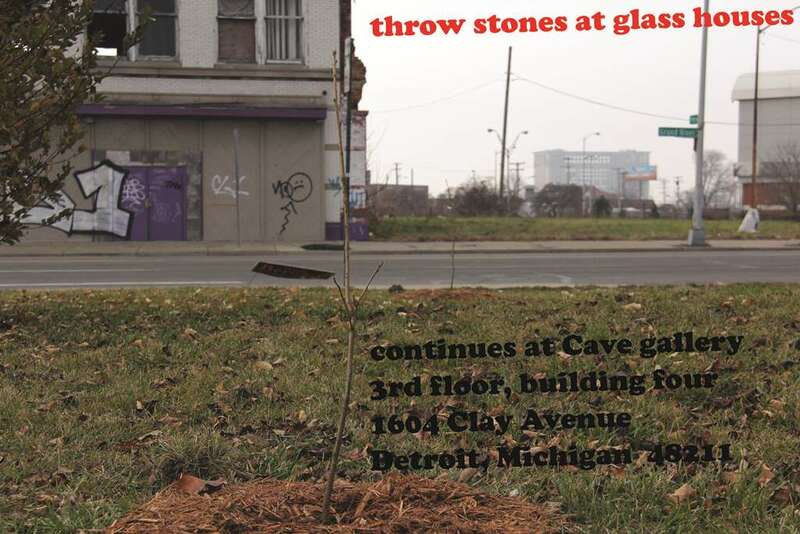 THROW STONES AT GLASS HOUSES happens simultaneously at Cave Gallery and the northeastern corner of Grand River Avenue and the John C. Lodge Freeway in Detroit. 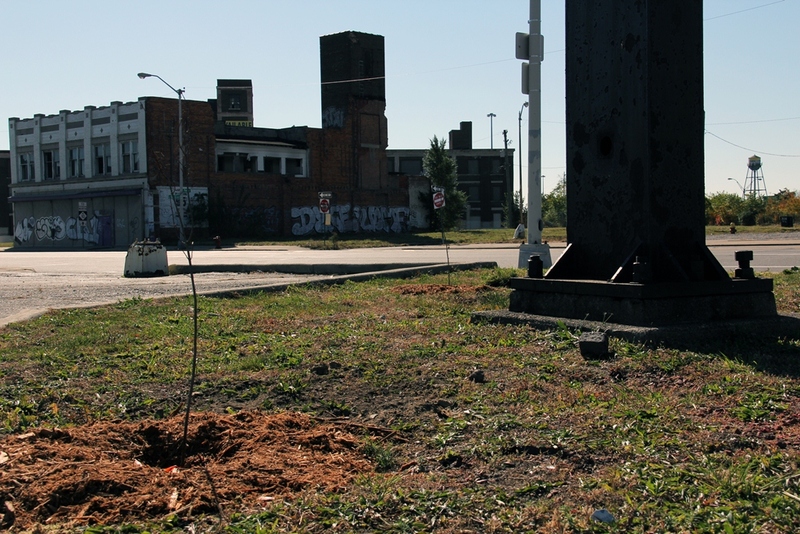 Two Burr Oak trees and two Autumn Red Blaze Maple trees planted at a vacant gas station where blocks of cement removed and transported to the gallery at Cave attempt to demonstrate a reversal of an empire built using privatized transportation. The glass houses that sustained sprawl are susceptible to stones cast from the street. During the revolutionary spring of 2011 in Tahrir Square, demonstrators used the street to hurl at police and build barricades. 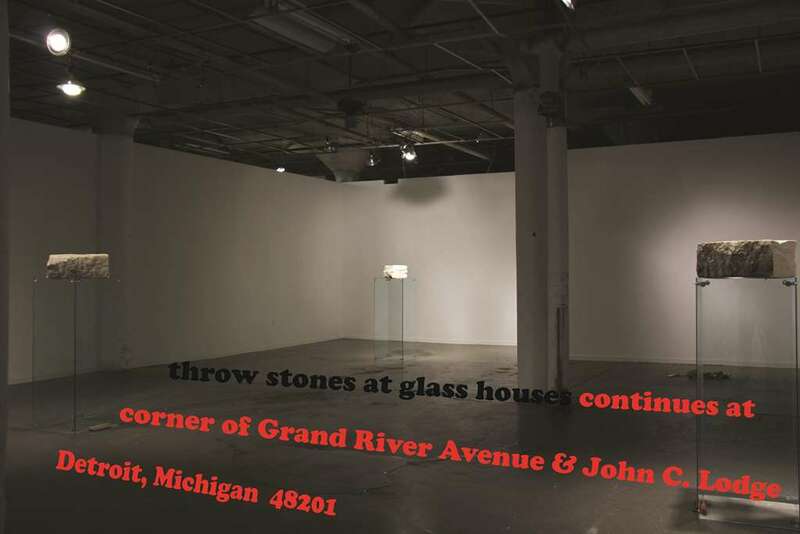 In throw stones at glass houses, the blocks of cement from a vacant gas station place on glass shafts at the gallery in a move reminiscent of John Knight’s use of twenty floral arrangements taken from Soho area restaurants and put on display at American Fine Arts in 1998. The inappropriate appropriation of property in throw stones at glass houses perhaps refigures the nature of the social at a political juncture. The barriers built by freeways are different than the glass skins covering some buildings, but windshields make some drivers insensitive to changes in the wind. Glass elevating cement inappropriately appropriated from a vacant gas station could, potentially, alter the street, sometimes an occasion for assembly and sometimes a route by which vehicles travel, in a liminal frame of reference where the pedestrian, in turn, walks through the street. The ground is uneven regardless of the so-called flat globe finance attempts to regulate. throw stones at glass houses uses the uneven ground to plant trees beyond the duration of the exhibition, changing carbon dioxide into oxygen in the atmosphere to counter increases in carbon emissions as a result of the burning of fossil fuels. Born in 1987 Royal Oak, Michigan, stephen garrett dewyer works as an artist, writer and curator. 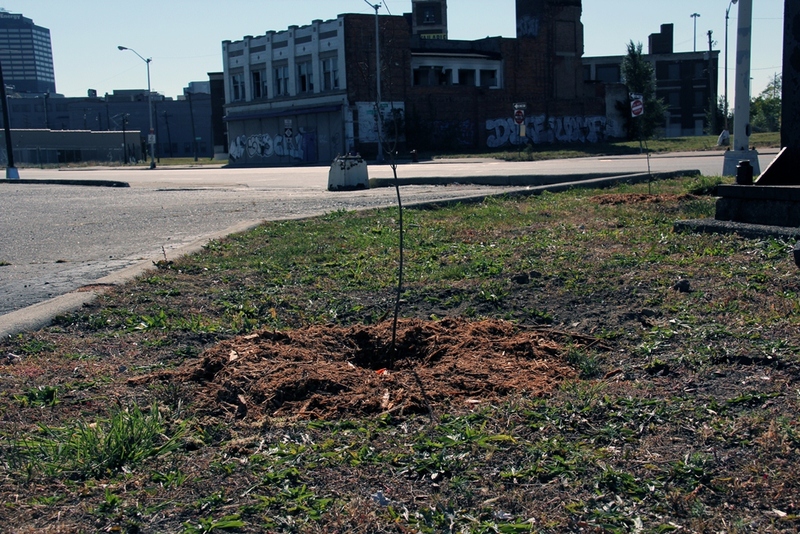 His work has been exhibited in Baltimore, MD; Detroit, MI; New Haven, CT and New York, NY. He graduated with a M.F.A. in sculpture from the Yale University School of Art in 2011. He curated Propositions ( http:// www.propositionsatarea405.c om/), 2009, an exhibition featuring the work of Neal Reinalda, Ding Ren, Glenn Shrum & Elena Volkova at Area 405 in Baltimore. He received his B.F.A. in Art History, Theory & Criticism in 2008 from the Maryland Institute College of Art (MICA) in Baltimore. He lives in Detroit, Michigan.